Philippines is an archipelago of 7,107 islands and islets. Imagine that some of these islands have names while others don’t and few have only the luxury to be seen during low tide. It is no secret That Magellan the great explorator while in search for the famous “Spice Islands” took refuge in one of our islands, probably to get some food and brought Christianity too along the way. But Helas, when he set foot in the island of Cebu was probably tired from long voyage, famished, weak and the moment he drugded into the shore, CLAAAACK…..his head chopped off with a corroded bolo of the local ruler Lapu Lapu. Though that is not exactly how our history teachers told us the story (sigh). And to compensate our courageous guy an entire family of an excellent fish was named after him. Well that is at least what most Filipinos think. Lapu lapu fish are groupers or garoupa. Their colors vary from beautiful orange and red to the wonderful tasting black ones. When I do snorkelling in the island of Cebu you will see Lapu lapu mostly on the reef hiding. Their stout body impedes them from swimming fast and of great distance. In Philippines it is one of the most priced fishes served on speacial occasions. The most common recipe for Lapu Lapu is steaming and dipped simply with soy sauce and kalamansi. You could also grill them and top with some sarciado (sautéed tomatoes). 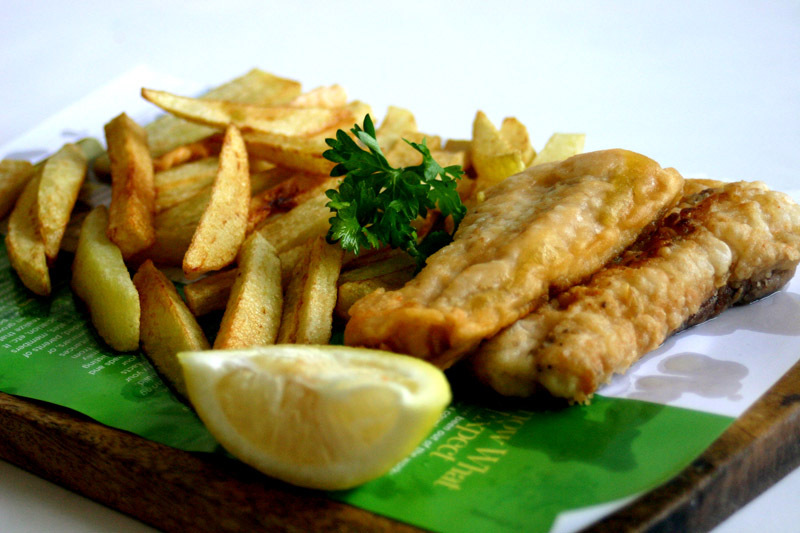 In here I tried to make some fish and chips dish using Lapu lapu fish fillet. If you happen to have a whole lapu lapu in your fridge and do not know how to fillet a fish check on the video. But if your lucky, you can buy already these lapu lapu in fillet. Wash and dry with paper towel your fish fillet. In a bowl put the lemon zest, lemon juice, half a teaspoon of salt and freshly ground pepper; cornstarch and half the flour. Mix well. Then toss in the fillets and add the remaining flour and coat well the fish. Put about 3 to 4 inches of oil on your fryer and fry the fillet until golden brown. Tips: Shake off excess flour before putting the fillet. Put them one by one so as not to abruptly shock the temperature of the oil. Be sure to put them when the oil is really hot. Serve with some fries. Wow, lapu-lapu ! I wonder what is the equivalent here ?! you can use salmon instead of lapulapu. crabmeat or white fish meat will do.